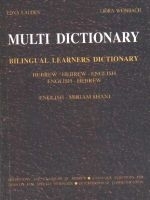 Edna Lauden is the author of the Multi Dictionary. The Multi Dictionaries have lots of features for the serious student. Each entry includes an example for how the word is used in the languge being learned.